An abusive man who breached a restraining order when he phoned and threatened his ex-partner has been fined and given a community order. George Smith Langton, 42, of Belper Road, Kilburn, Belper, repeatedly contacted his ex via Snapchat before he called and told her he was going to slit her throat, according to a Chesterfield magistrates’ court hearing. Prosecuting solicitor John Cooper told the hearing on February 25 that Langton was already subject to a restraining order which had been imposed in September after he had previously sent his ex threatening messages. He added that on February 8 Langton sent nine Snapchat messages and he said he was coming around to his ex’s home at Ripley and she ex replied that he had better not. Langton also called his ex during the early hours of the next day on February 9, according to Mr Cooper, and said he was going to “finish the job” and slit her throat. Mr Cooper said the complainant stated she was subjected to a barrage of abuse before Langton called her sister and once again threatened to slit his ex’s throat. Langton pleaded guilty to sending electronic communications on February 9 that were grossly offensive or menacing. He also admitted breaching a restraining order which had been imposed in September. Langton has since been referred to a mental health unit, according to Mr Lau. Magistrates sentenced Langton to a 12 month community order with a Rehabilitation Activity Requirement. 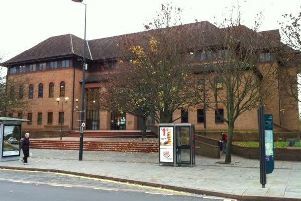 He was also fined £50 and must pay an £85 victim surcharge and £85 costs.